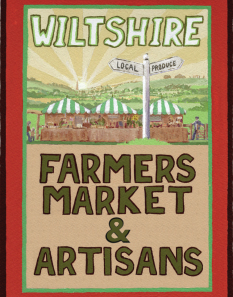 The Wiltshire Farmers Market is held from 9am to 1pm on the fourth Saturday of each month in the market area by the Town Hall, High Street, with local food from the local producers, truly traceable food you can trust. Most producers grow and rear their products within Wiltshire’s borders; a few come from surrounding counties. People making products also support local farmers and growers by using own or locally grown/ reared ingredients where possible.